Dr. Gaurav Gopalan was a young, prolific contributor to the American Helicopter Society and researcher at the Alfred E. Gessow Rotorcraft Center at the University of Maryland. Dr. Gopalan was an Assistant Research Scientist in the Department of Aerospace Engineering and worked with Professor Fredric Schmitz in the field of helicopter acoustics. He was known and loved in multiple communities. A passionate thespian, he was also an active member of the Washington Shakespeare Company, where he served as an assistant director and stage manager. Dr. Gopalan was also president of his own consulting business. He was born in New Delhi, India on December 6, 1975. An outstanding student, he graduated from the Indian Institute of Technology, in Kanpur India. After his graduation in 1998, he won a fellowship in the Aerospace Department at the University of Maryland and moved across the globe to the Washington DC area to obtain his graduate education. Gaurav firmly believed that America was the place for him to begin his career because he felt that the United States free enterprise system recognized hard work, innovation, talent and enterprise. Working as a research assistant in the Alfred Gessow Rotorcraft Center over the next several years, he earned his Masters and Ph.D. degrees, specializing in the field of rotorcraft acoustics. He received many awards and scholarships and maintained a 4.0 GPA throughout his graduate education. He was a key founding member of a then recently established research group that was led by Professor Schmitz. 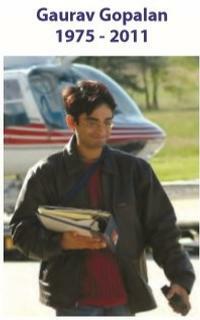 Dr. Gopalan was immediately drawn to the challenges of reducing helicopter external noise, and especially enjoyed the theoretical aspects of the research work that combined the fundamentals of helicopter acoustics and optimization techniques with practical aspects of helicopter performance. One goal of the research that he chose to work on was to explore new ways for helicopter pilots to “fly quietly” so they could minimize the noise to nearby communities. His Masters and Ph.D. theses developed a new theoretical method to predict the noise radiation of a helicopter in accelerating/decelerating flight. This new analysis resulted in significant modifications to the classical methods of ground noise map estimation used by both the rotorcraft industry and Department of Defense. His findings were presented to industry at AHS technical forums and specialists’ meetings and in technical journals. NASA also incorporated this new modeling procedure, as an option, in their existing Rotor Noise Modeling (RNM) code that predicts helicopter external noise radiation. In his early days at the University of Maryland, Dr. Gopalan’s enthusiasm affected everyone around him. As he often commented, research at the fundamental level was fun because it was a challenging puzzle that needed to be unraveled and explored. No one knows the answers to Mother Nature’s secrets– but he believed that by working hard and using his God-given observation skills, he could be among the first to unravel her secrets. Because of his capabilities and interest, Dr. Gopalan was offered a postdoctoral position at the University of Maryland. In that role he assisted in teaching graduate level courses in acoustics. He was an excellent teacher, patiently explaining difficult concepts with an innate understanding of the student’s point of view. He was also demanding, keeping the learning goals at high levels, so that the students would leave Maryland with a solid knowledge of rotorcraft acoustics. In addition to teaching, he also broadened his research work to be applicable for community noise planning purposes and co-authored several articles on this subject with other Maryland faculty and researchers. blowing controllers, a direct derivative of Gaurav’s theoretical analysis. As in any experiment, the experimental problems were often daunting. However, Dr. Gopalan’s ever-present leadership skills and positive attitude resulted in a unique set of experimental data that will be reported at this year’s AHS Annual Forum. As the good news of this experiment unfolded, it was apparent that it was one of the happiest and most professionally fulfilling times in Gaurav’s far too short life.